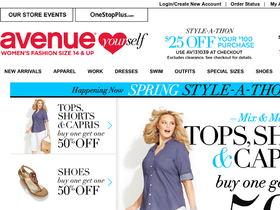 Avenue, online at avenue.com, is the place for you to find the hottest new styles in plus sizes. Avenue offers a huge selection of trendy clothing in sizes 12-32. Products offered at Avenue include clothing, shoes and boots, swimwear, lingerie, dresses and suits, and coats. Even find jewelry and handbags with Avenue. They are committed to providing all customers with affordable clothes that fit. So check out the latest fashions at Avenue and remember to stop by RetailSteal to get the best Avenue coupon codes, Avenue promotions, and Avenue discounts. Available shipping methods via UPS, and USPS are Standard, Express, Superfast, Next Business Day, and even Saturday. Avenue does not ship internationally. See website for full details, exclusions may apply. Shop at Avenue and enjoy 25% savings on 2 items. Click here for code. Shop at Avenue and enjoy 20% savings on 1 item. Click here for code. Act now and enjoy free shipping on your order of $100 or more from Avenue.com. Click link to shop the clearance section at Avenue and save up to 80% off a wide selection of apparel and accessories.